Take on anything this summer in style with the Sofft Milan. 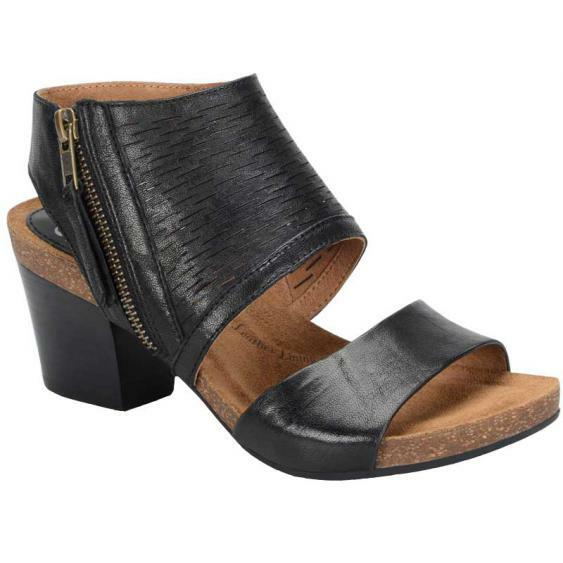 This dress sandal has an upper made of full grain or metallic leather in a two part design. The bold zipper and slit detail give it a unique look and the leather linings are easy on a bare foot. The footbed of the Milan will keep you going all day with its suede lining, soft foam padding, and molded cork midsole. The 2 ½” stacked heel and ¾” platform give you a boost in height but thanks to the textured TPU outsole, you’ll feel plenty stable. With style AND comfort, the Sofft Milan has exactly what you need in a summer shoe.